An exciting morning playing with Procion dyes. What are procion dyes, well they are a dye that can be used on fabrics that contain cellulose fibres such as cotton and linen but they also work well on silk, rayon and viscose fibres too. 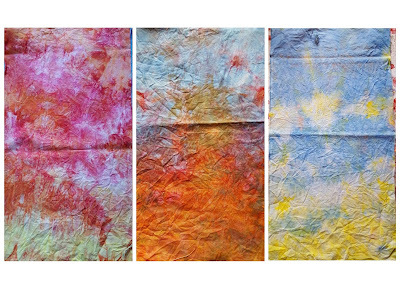 They are also known as fibre reactive dyes and soda ash is used to fix the dye into the fabric to make it permanent. There are many ways of using these dyes and over the course of the City and Guilds levels the students will be learning different techniques for using these versatile dye powders. In our class we used a very simple method, because we were only dyeing a small amount of fabric, our little 10g pots from Colour craft (which we now stock at Busy Bee Patchwork) would dye approximately 2 metres of dry weight fabric. I chose to use PFD which is a beautiful quality 100% cotton that has been prepared for dyeing hence PFD, this means there is little or no sizing in the fabric to hamper the strength of colour. The quality is what you would expect from a high end 100% cotton patchwork fabric. Of course when practicing you may not want to go the this expense so you could use old sheets, calico, muslin, scrims, linens or anything you have at home as long as it is not an animal fibre where acid dyes are recommended. Where new fabric is purchased, it must be washed in a detergent with no softener added to remove any sizing that may be in the material, sizing is like starch it gives the fabric a crisp feel or handle sometimes disguising poor quality fabrics. I expect this has happened to you where you've bought something and then washed it and it turns into something that resembles an old dish cloth, been there, done that, and got the t shirt come to mind! But that's okay too because we are a resourceful bunch, we textile artists and to me even an old dishcloth could find it's way into an amazing work of art. again mix until the salt dissolves. We mixed up 3 colours Red, Blue and yellow the three primary colours and from this we were then able to mix the 3 secondary colours orange, purple and green. 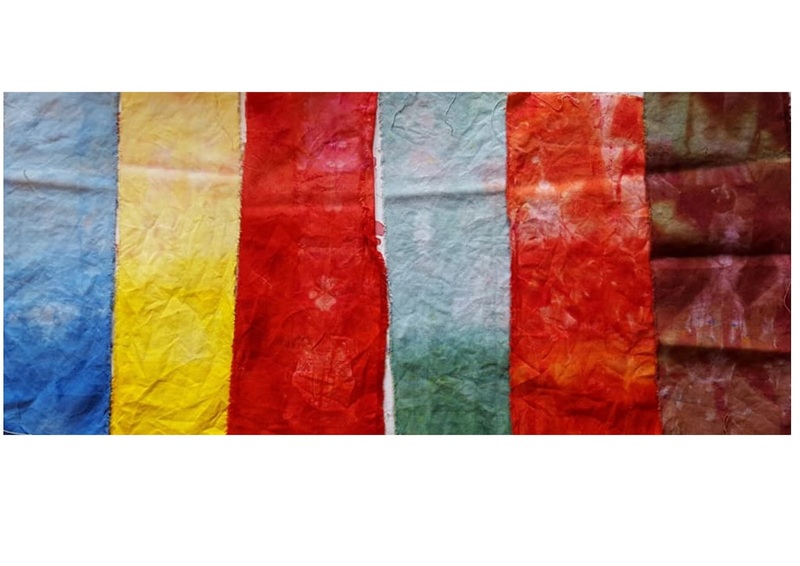 Now, depending on which red, blue and yellow you use will depend on the colour of secondary colour you get and each maker of procion dyes may have their own names so if you are serious about dyeing your own fabrics and want to repeat colours then I suggest you use the same make of dye. Even then there are combinations of the primary colours, for example golden yellow, utramarine and scarlet, lemon yellow, vermillion and navy. It can become a very intense science. Above is a sample of grading colours and mixing the secondary colours. On the left are 3 primary colours, going from dark to light. I think I might do this again using a longer piece of fabric so I can see more clearly the difference in colour intensity. The three colours on the right are the result of mixing two primary colours again this wasn't as successful as I would like so I think I will try this again on bigger pieces of fabric. My success came from the cram dyeing technique firstly with two colours and then with 3 colours. I absolutely love them and will definitely will be using this method again. The random effects of cramming the fabrics causing a resist in the creases and the blending of colours is so satisfying! I don't profess to be well adversed in the techiniques of dyeing, it is a whole qualification in it's own right and I take my hat off to those who do this craft every day, but this quick little method will certainly go a long way to making some gorgeous fabrics for all sorts of applications. I really like the creased effect as well. Over half term the ladies have been producing some gorgeous things!! Celia's super amoebic stencils and machine stitched detail is going to be turned into an evening bag! How effective is this, Kay has stencilled the lion onto a woven background which I may say at it's conception she hated ! 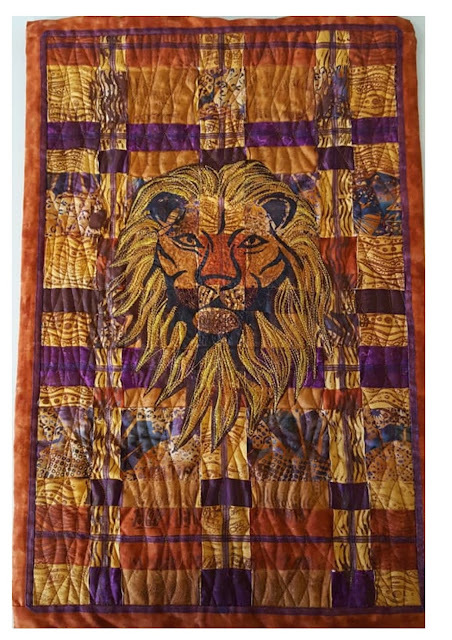 Printed onto the background and has machine stitched detail into the lions mane with satin stitch and free motion stitching. A quilted background also breaks up the original woven fabric. Now it's one of her favourite pieces. Mel has been working her little socks off and has produced this wonderful piece inspired by Klimt. Focusing on the colourful cloak and the patterns that adorn it. She has applied cut fabrics and machine stitched the background, this piece has leant itself very well to the woven fabrics, it is so surprising how all these pieces have turned out so different and diverse. Above Mel has taken inspiration from a picture of a garden in Morocco and my word ! you just want to be there amongst the tropical plants and sat by the cooling fountain, just wonderful. Raw edge applique and free motion detail make up this colourful work of art. Another beautiful piece from Mel, she has been putting in the hours at home. 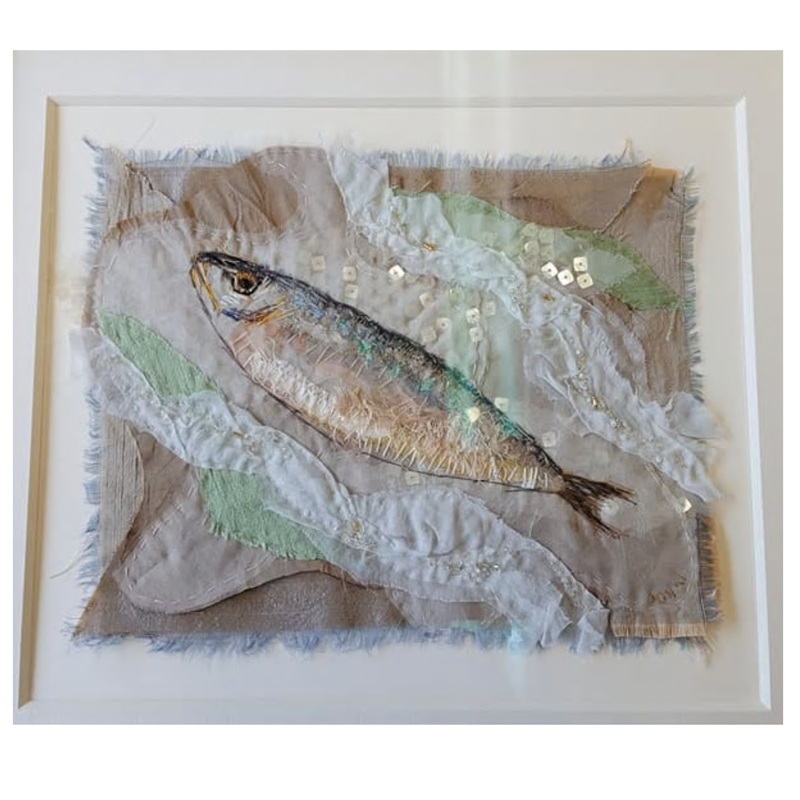 The layered watery organzas give the appearance of a clear stream, home to this little fish happily swimming around his part of the water. Hand stitched detail Just beautiful!! I love Linda's sunset, I hope you don't mind Linda but I photoshoped a silhoette to show the picture off at it's best. 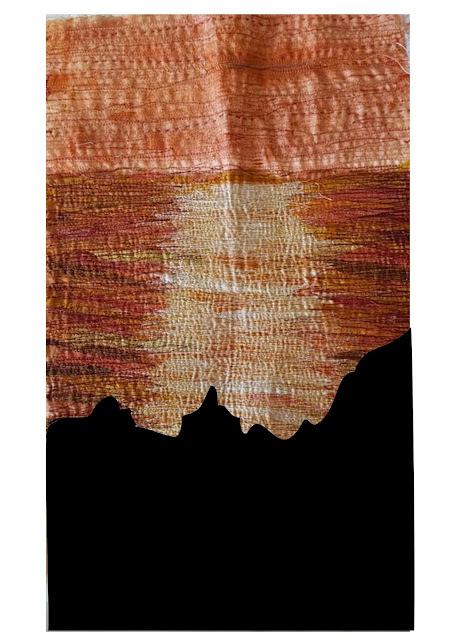 Linda has painted the background fabric and freemotioned stitched the sea over small snippits of oranges, ochres, yellows and oranges and used lighter colours in the centre to show the sun setting over the sea in Kefalonia. A wonderful reminder of a lovely holiday Well done Linda a really super piece of machine stitching!!! I think that's it for this week, if the snow continues I'm going to be trying some snow dyeing as opposed to ice dyeing. Here's what to do if you fancy a go too. Wash some fabric in detergent no added softner! Soak in soda Ash or soda crystal for 10 minutes prior to dyeing. 2 tbs to 2 gallons of water. You will not be able to use these again for food preparation! Scrunch up fabric, fold fabric, pleat fabric and pack with snow or crushed ice, cover completely and sprinkle procion dye onto the snow. Do not use too many colours and a small amount of dye goes a long way, but not enough will result in a very wishy washy pattern. You will have to judge this. If you have problems with breathing such as asthma then wear a mask over your face and use throw away spoons such as coffee sticks to sprinkle powder. Cover your area well so as not to get dye over work surfaces, wear plastic gloves and leave the snow or ice to melt over night, the patterns can be quite amazing. Good luck if you have a go and let me know how you get on. Keep warm, Keep safe and take advantage of the bad weather to do some stitching! !